After the Phaser and the Flanger, part 3 of this series of posts dedicated to modulation effects will focus on the Chorus. Used and abused with clean tones in the eighties, it seemed to have lost its popularity in the early nineties but it remains a classic. I have prepared a few videos to show you how useful a Chorus is for clean and distorted tones. I have used for this purpose my “modern” Boss CH-1 as well as my vintage Boss CE-2. You will find at the end of this post a short selection of chorus pedals. The Chorus effect occurs in the real world when two musicians (or singers) play the same piece in unison. Because the two don’t have exactly the same pitch and timbre, it creates a “choir” effect. Electronically, the effect is produced by mixing the incoming signal with a slightly delayed and detuned copy of itself. The pitch difference is modulated to create oscillations. What is the difference with a Flanger then? One of the chief differences (but not the only one) is that the delay time on Flangers is shorter than it is on Choruses. Flangers have a “jet plane” type of sound but Chorus pedals don’t. Nevertheless, Flangers and Choruses can sound similar depending on how they are set. The first acknowledged chorus pedal is the Boss CE-1, released in 1976. It actually started the Boss brand, a subdivision of Roland. Somehow, it sounded so cool that everybody started using it. When the eighties arrived, every guitarist in almost any genre had to have a chorus pedal in their arsenal. It was a must for clean tones as it made them sound fatter, akin to a twelve string guitar. Andy Summers of The Police is a known user of the Boss CE-1 and you can hear its chime in a lot of The Police records. But the use of Chorus was not limited to pop, it was also used in rock, funk and jazz. Actually, the Boss CE-1 is based on the integrated Chorus circuit of a Roland amplifier which is still a reference amongst transistor based guitar amplifiers: the JC-120 aka Jazz Chorus 120. It is fitted with an integrated stereo chorus effect. This amp was used by countless artists and not only in Jazz, Robert Smith of The Cure as well as Joe Satriani used it at some stage in their careers. Most Chorus pedals have at least two settings: Depth and Rate. The Depth setting controls the intensity whereas the Rate setting controls the speed of the oscillation (the amount of swirling). The Boss CH-1 that I feature in the videos below has another two settings which are quite rare on most chorus pedals: MIX to control the amount of direct sound and chorused sound and EQ which controls the brightness of the effect. When it comes to placing your chorus in your effect chain, it is usually recommended to place it after your distortion or overdrive (or in the effect loop of your amp). Nevertheless, it is also usable before a distortion/overdrive, the effect will be less “precise”. It is quite important to realize that some chorus pedals are really warm sounding whereas others are more transparent. If you are looking to emulate the sound of Kurt Cobain in the intro of “come as you are”, forget about using a pretty transparent chorus pedal, you need the dirty analog type (for the record, he used an Electro Harmonix Small Clone). Some guitarists hate that type of very fat chorus and prefer the transparent type. In that respect, the two pedals I am using in the videos below represent quite well these two types of tones: the CE-2 is warm and fat while the CH-1 is pretty and transparent unless you really push it. Also note that the CE-2 is mono whereas the CH-1 can be used in stereo. I show here mild as well as extreme settings with both my BOSS CE-2 and BOSS CH-1. My basic tone features some compression courtesy of an MXR Dynacomp. Note how I have to put the level fairly high on the CH-1 to get a pronounced chorus effect. Gear used for the demo besides chorus pedals: 1978 Fender Telecaster with stock pickups, MXR dynacomp (OUTPUT at 3 o’clock, SENSITIVITY at 9 o’clock), 1974 Fender Champ. Some compression and reverb were added in Cubase. Putting a chorus after a rather distorted tone will transport you back to the shredders of the eighties. Not all of them used a chorus for their lead tone but some definitely did. Gear used for this demo besides chorus pedals: Custom Made guitar by Robin Bully, bolt on neck equipped with Schaller Pickups (Golden 50 in the bridge position), Analogman TS-9, Analogman DS-1 and Fender Champ. Some eq, compression and reverb were added in Cubase. I used a graphic equalizer to scoop the midrange and get a more “metal” tone out of my Fender amp (more on this in another post). Boss CE-5, CH-1 and CE-20: with these three models, Boss covers the whole spectrum of chorus sounds. The CE-5 is the last in the CE line, the CH-1 is probably more transparent. As to the CE-20, it is a sophisticated digital modeling pedal that can emulate the sound of different models including the CE-1. All these pedals are stereo. Electro Harmonix Small Clone: the sound of Kurt Cobain on “Come as you are”, analog and fat. Line 6 Space Chorus: a digital pedal that I had the chance to try. Very versatile, I especially like the “Tri Chorus” emulation which is based on a rare 80s unit. Ibanez CS-9: a stereo analog pedal, it is a reissue of an 80s classic. MXR Micro Chorus: recently re-issued, it is a simple and small one button pedal which offers a lot more different sounds than you would think. Retro Sonic chorus: Retro Sonic has made a specialty of recreating classic models. Their chorus is a faithful recreation on the Roland/Boss CE-1 in a more compact form. Analogman Chorus: the father of all boutique manufacturers offers some popular and tasty analog chorus pedals. 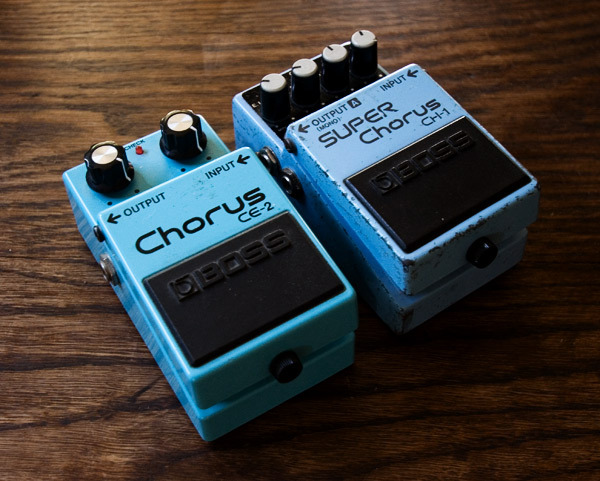 A note about stereo chorus pedals: In order to use this capability efficiently with the guitar, you need two amplifiers, a stereo amp (quite rare) or a stereo rack system. In Part 1 of this series of posts dedicated to modulation effects, I presented the Phaser. In Part 2, I will focus on an effect that has been around since the 60s: the Flanger also known as Flanging. We will see how it can be useful to us guitarists and in what style it is more prominently used. As always, I have prepared a few videos to demonstrate the Flanging effect, for which I have concocted some cool settings on my trusty Boss BF-2. The Flanging effect originated in studios in the sixties. It was generated by recording then playing back one piece simultaneously on two tape recorders. The result of the two tape recorder playback was recorded on a third tape recorder. Because the two tape recorders reading the piece were slightly out of sync, it created a phasing like sound. This could be emphasized by pressing on the “flange” or rim of one of the tape reel to slow down the playback. The delay between the two tape recorders would then be more pronounced and create a “jet plane” effect that came to be known as “flanging”. It was used at first to enhance whole mixes, the end of “Bold as Love” by Jimi Hendrix is the first example of stereo flanging in history. Progress in electronics allowed engineers to recreate this effect without having to use bulky tape recorders and make units that could fit in a pedal. 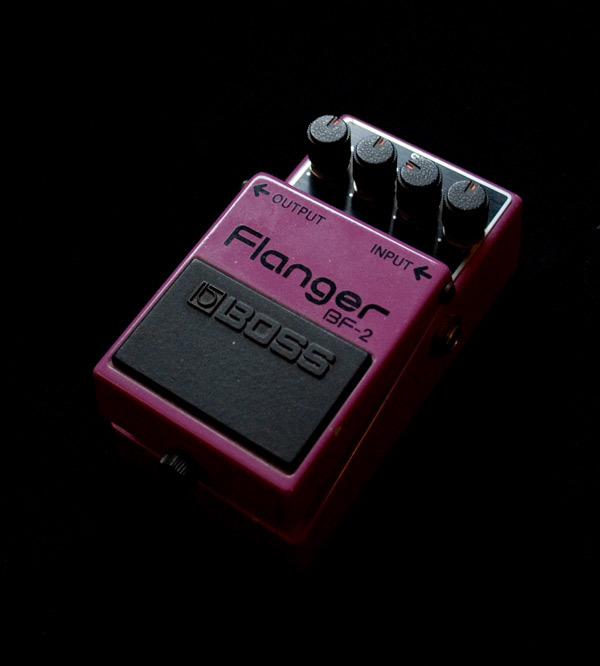 The trick used by Flanger pedals is to use a very short delay and some oscillator to slightly vary the delay time. Analog models use bucket brigade components, see my posts about delays for more information. Actually, if you set a delay pedal with a very short delay time, say 1 ms, you will start to get a hint of flanger effect but not as pronounced since there is no oscillation. Most Flanging pedals have at least a Depth and a Rate or Speed knob. Depth sets the intensity of the effect whereas Rate sets the speed of the oscillation. The Boss BF-2 that I use in the videos below is more complex and has no less than four controls: Depth, Rate, Manual and Res. Res is a resonance setting which can be labeled as “regen” or “feedback” on other models. It controls how much of the processed signal is re-injected into the effect to get a more intense result. The Manual setting is specific to the BF-2 and apparently affects the amount of delay but I have no proof of that. A generic word of advice for pedals which offer 4 or more settings since it can be overwhelming at first : try putting everything half way first, then adjust from there. Flanger pedals really became mainstream in the late 70s and were primarily used by rock guitarists. Before I show you how it sounds with a distortion, let’s see how it sounds with a clean tone. Gear used for the video: Fender American Classics Custom Shop Stratocaster with Kinman AVn Blues pickups, 1974 Fender Champ Amplifier (Volume at 2, Bass at 10, Treble at 2.5). Distortion and Flanger: Before or After the Distortion? As I wrote in my Phaser post, Eddie Van Halen used a phaser a lot but little is known that he also used a flanger to create some of his best tones. “Unchained” is probably his most recognizable Flanger tone. Queen’s Guitarist Brian May is also a big flanger fan, listen to “Keep Yourself Alive” for a fine example of tape flanging. The Flanger effect is usually placed after overdrives and distortions in the chain but it can also be interesting to place it before, which is something that Prince does for instance. I will show you in coming videos the difference between the two placements. Gear used for the video: Fender American Classics Custom Shop Stratocaster with Kinman AVn Blues pickups, 1974 Fender Champ Amplifier (Volume at 2, Bass at 10, Treble at 2.5), Analogman modded Boss DS1 Distortion (Dist at Max, Tone at 8 o’clock and Level at 10 o’clock). 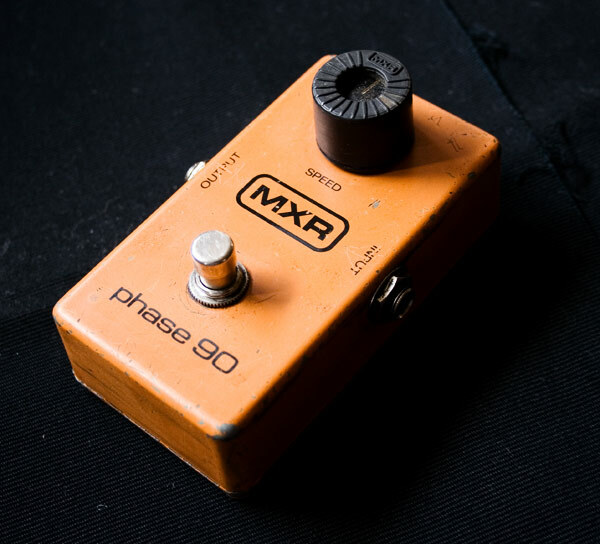 The MXR Flanger is one of the oldest flanger pedal designs around and has been reissued recently. Since Van Halen used it quite a bit, MXR has released an EVH model. The MXR Micro Flanger was recently re-issued and packs a lot of good flanged tones in a tiny package. The Electro Harmonix Deluxe Electric Mistress has been used by David Gilmour but also by Andy Summers. Rumour has it that what everyone thinks is a chorus in some of The Police’s clean tones is actually an Electric Mistress flanger. The Boss BF-2 which I have demonstrated in this post is sadly discontinued but it is relatively easy to find on the second hand market as it was in production for 20 years (between 1980 and 2001). It is quite versatile and is especially great for early 80s new wave clean tones à la The Cure. The Boss BF-3 has replaced the BF-2 in the Boss range. Although it is not clearly stated on the Boss website, I am pretty sure it is a digital pedal which gives it two rare particularities: it is stereo and there is a “tap tempo” feature to set the speed of the oscillation just by tapping a footswitch. The Ibanez FL-9 is another classic 80s design which has been reissued. It gives a warm but high quality flanging tone and has its own personality. I personally own one and I will probably do a BF-2 versus FL-9 post. You can also spot it at around 4:35 in this video presenting the gear Joe Satriani has used on the Chicken Foot tour. Maxon, the manufacturer which used to make the Ibanez pedals in the 80s, has also an FL-9 reissue in its range. I could not tell you which one is better and/or more authentic. Flanger is not huge on the “boutique” market but there are a few models, check out the Strymon Orbit or the T Rex Twister and Tonebug Chorus Flanger.